This boys suit is always our top seller. This boys suit is a very well made, fashion forward boys suit available in many colours.This suit is perfect for graduation, First Communions, weddings, Ring Boy or any special occasion that requires boys formal clothing. Category: Baptism Clothing, Boys Baptism Clothing, Boys Clothes, Boys Suits for Weddings, First Communion or Any Formal Event. Tags: boys white baptism suit, boys white first communion suit, boys white suit. This affordable 5 piece boys white suit includes a 2 button single breasted jacket with inside pockets, pocket flaps, side vents, notched lapel. Pants have a flat front with belt loops elastic back up to size 10. Vest has pockets, 3 or 4 buttons depending on the size, back adjustable buckle. Shirt is a poly blend for easy care , fashion print or solid colour tie or bow tie. Very well made, fashion forward boys suit. 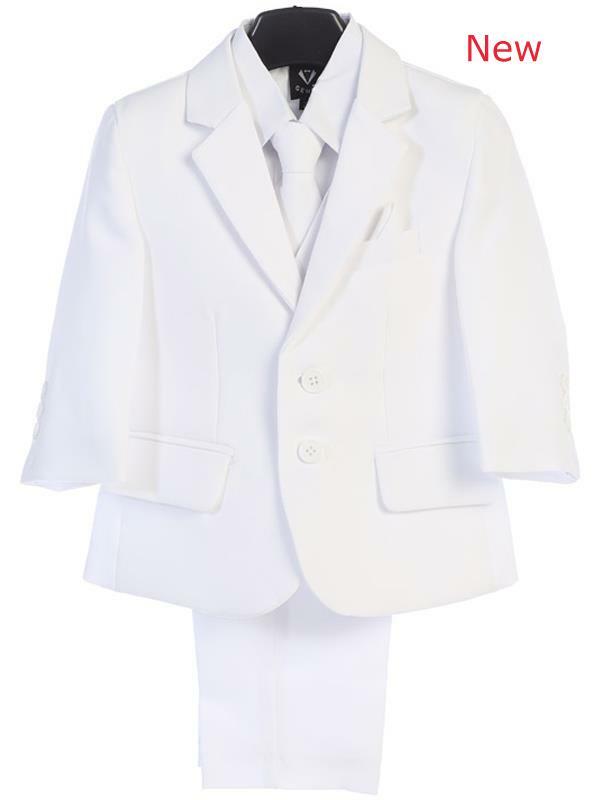 This is a great boys white suit for weddings, Ring Boy, First Communion, graduation or any formal special occasion requiring boys formal clothing. 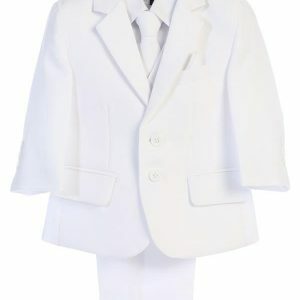 This is our top selling, best made, best priced boys white suit. Also available in light gray, charcoal gray, black, navy. Chest – around the fullest part of the chest. Shoulder to shoulder – edge of shoulder to the other edge. Please call 905-465-2195 if you need assistance to insure the proper fit. These measurements are the actual measurements of the garment leave room to accommodate for body movement.